Today you will meet Nymaa who taught herself English, enrolled in our 3 Keys IELTS course and got an overall Band score of 7.5 on her first IELTS attempt. Nymaa has been a listener of the All Ears English Podcast for the past 5 years. Nymaa practiced her writing by completing a Task 1 and Task 2 essay every day while she was studying. On test day she struggled with the timing. She spent too much time on Writing Task 1 and in Writing Task 2 she did not have time to check her essay. She also didn’t use alternatives to important vocabulary words so she repeated a lot of words. She hadn’t practiced any of the essay topics that appeared on the exam. The essay was an argument essay. Don’t over-practice! Instead of taking too many practice tests use that study time to read great material so that you have vocabulary for test day. Before Nymaa had 3 Keys IELTS she tried to prepare by herself but she couldn’t do it. She learned every strategy for every question type. She used the templates and the practice exercises to improve her skills. She already felt that she had strong listening skills when she came into the course because she had been listening to podcasts for a long time. For T/F/NG questions Nymaa tried to answer the questions then she went back and matched the keywords then analyzed why they were True, False or Not Given. Sometimes students make the T/F/NG questions too abstract by matching the meanings but it’s more about matching the keywords. For students in our 3 Keys IELTS course you can always ask your questions in the Facebook group and get a quick reply. 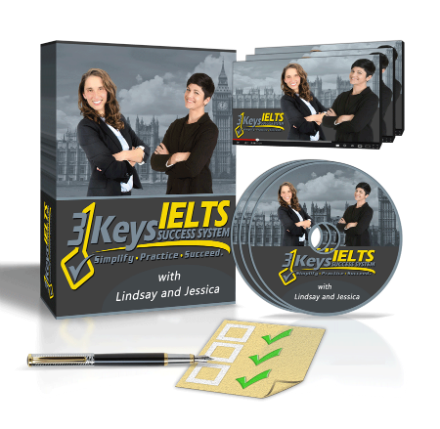 If you are just listening to the podcast you must join 3 Keys IELTS. Before she was a student of the course she felt like she was missing the most important strategies by only listening to the podcast. She recommends that you join the course then listen to the IELTS Energy Podcast and combine that with IELTS Energy TV. Leave us a comment below or ask a question!